Picross Nonograms is a number puzzle game where you reveal a hidden image by evaluating number clues. The HTML5/Mobile version Daily Nonograms works on desktop computers and tablets. It is a similar game made by a different game developer. The Picross game includes an amazing 100 free nonograms to solve, ranging in difficulty from Easy to Extreme. To begin playing, wait for the game to load, then click the PLAY button. If you like this game, you might enjoy the other free math games and puzzle games on this site. HOW TO PLAY. A nonogram is a type of puzzle where you evaluate the numbers on the side of a grid, coloring in the cells of the grid or leaving them blank, in order to reveal a hidden picture. These puzzles are also known as picross, griddlers, or hanjie. They can be simple or quite challenging, depending on the number of cells in the grid. To color in a cell, simply click it with your mouse. You can also place an X in cells that should remain blank by holding down the SHIFT key and left-clicking the cell. Examples of the hidden images found in this nonograms puzzle game include House, Ladybug, Superman, 8 Ball, Unicorn, and dozens more. After the game loads, the main menu displays. In that menu, you can click PLAY to start the game, INSTRUCTIONS for a brief tutorial, or SETTINGS to change the game quality or mute the sound. On clicking PLAY, you are presented with the puzzle selection screen. This lists the available puzzle packs (based on difficulty) as well as each puzzle in the pack. On the left side, you can choose the difficulty level of the puzzles you want to try and solve by clicking the appropriate pack. You can choose from Easy Pack all the way up to Extreme Pack. To minimize frustration, because these puzzles can be tough, I recommend you start with the easier nonograms and work your way up. After picking one of the packs (by clicking on it), you then can scroll through available nonograms in that pack on the right side of the screen. 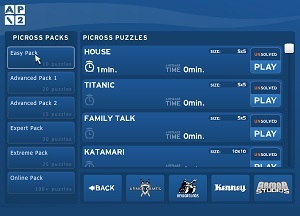 For example, when you select the Easy Pack, you'll see 10 nonograms on the right side to choose from, including House, Titanic, Family Talk, and more. Click the PLAY button on the nonogram you want to solve to start that puzzle. Note that many of these picross nonograms have a timer! So you have to solve them in the time alloted, making these extra challenging. Numbers are shown on the left side and top of the nonogram grid. These numbers are clues to which cells you should color in or leave blank. The numbers on the left side are clues for the horizontal row to the right of those numbers. The numbers on the top are the clues for the columns. So when solving these picross nonograms, for each cell you need to take into account both the horizontal and vertical number clues associated with each cell. If you click the Instructions button on the game's main menu, you can walk through a simple example showing how to solve a nonogram. As an example, if you see "1 1 1" to the left of a 5-cell row, that means in that row are three colored cells with a single space between them. So if you see a "5" to the left of a 5-cell nonogram row, it means all 5 cells in that row need to be colored in. If you've never solved nonograms before, start with the Easy Pack until you catch on to how it works. If you give them a chance, you may really enjoy solving this type of puzzle. 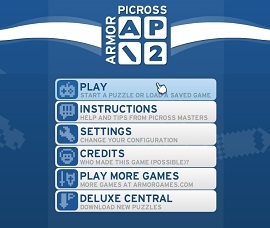 Games like Picross Nonograms train important brain skills including logical reasoning, quantitative reasoning, and arithmetic. 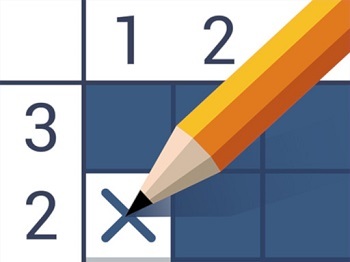 Solve these puzzles often to give your brain a boost! Game distributed by FatRatGames.com. Used with Permission.